The World War II Liberty Ship Flying Enterprise was lost in 1951 after it was caught in a late December hurricane in the mid-Atlantic. The ship took on an ominous 30 degree list after the cargo shifted in the rolling seas. Then a crack developed amidships across the main deck and 12 feet down each side of the hull and the engine room flooded. That happened on Christmas week. It took over two weeks for the Flying Enterprise to sink, however. In the meantime, the world was captivated by the news stories telling of the dramatic attempts to save the ship and tow it to safety. The drama involved a brave captain and second sailor who remained aboard the stricken vessel until almost the last moment. They literally jumped from the smokestack to safety after the tow line parted and the ship sank from under their feet on Jan. 10, 1952. When it foundered the Flying Enterprise was just 42 miles away from Falmouth, England. That skipper’s name was Henrik Kurt Carlsen. The man with him was Ken Dancy, the mate from the tugboat Turmoil who jumped to the deck of the Flying Enterprise while attempting to attach a tow line. Once aboard the sinking vessel, Dancy couldn’t get easily back, so he rode out the drama with Carlsen. The final voyage of the Flying Enterprise began Dec. 21 at Hamburg, Germany. It was bound for the United States with a cargo of 1,300 tons of pig iron and 900 tons of coffee. Also aboard were ten passengers. 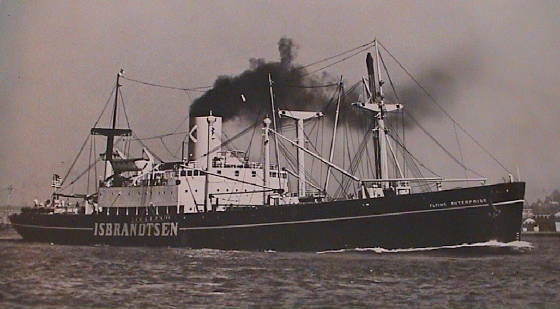 The ship was owned by Isbrandtsen Shipping Co. of New York. The storm caught the vessel about 400 miles west of Lands End on Christmas night. The pounding seas and gale continued for several days. One large sea caused the ship to roll hard to port, and it failed to right itself. The cargo shifted. At about that time the crack was discovered on the weather deck. An SOS was answered by several ships and the passengers and crew were removed by lifeboats from the U. S. Navy troopship General A. W. Greely and the Steamer Southland on Dec. 29. The seas were still too high for the lifeboats to pull alongside the stricken ship so everyone had to jump into the sea before boarding the boats. Captain Carlsen chose to remain with the ship to await the arrival of a tug. The salvage tug Turmoil reached the Flying Enterprise on Jan. 3. But there was a problem. With only Captain Carlsen aboard the listing ship, it was impossible to connect a tow line. After several attempts, Dancy made his daring jump from the tug onto the deck of the foundering ship and brought with him a rope attached to a tow line. By now the Flying Enterprise was listing by about 60 degrees. The storm was abated however and the Turmoil began the long tow toward the English Channel. By now, due to drift, the estimated location of the ship was about 300 miles from Falmouth. The listing hulk was a difficult tow. Because it was heeled over, the ship sheered from one quarter to the other. The two vessels were traveling at a speed of only about three knots in a long Atlantic swell. Then on Jan. 8 the weather deteriorated. Another gale developed when the Flying Enterprise was only 60 miles from safety. The tug was forced to heave to, with its bow into the storm. And the sinking ship was now riding deeper in the water and rolling to about 80 degrees. The tow line parted on Jan. 9. When the ship began showing signs of breaking up, Captain Carlsen and Dancy were forced to jump from the ship’s funnel into the sea, where they were picked up by the Turmoil. The date was Jan. 10. From the deck of the tug they watched the Flying Enterprise sink. They said her bow rose into the air, held for a few moments, and then in a classic ship-sinking image, slid beneath the sea. Carlsen received a hero’s welcome when he came ashore at Falmouth. He later was awarded the Lloyd’s Silver Medal for meritorious service in recognition for his attempts to save his ship. One final note: his next command was the Flying Enterprise II.